I have some very happy news to report – we have finally sold our old house! Those who have been reading a while may remember that we moved into our wonderful new home back in the fall, but unfortunately it took us a bit longer to get rid of the old one. Initially I had planned to make a celebratory meal when we moved into the new house, but paying two mortgages did not make me feel like celebrating at all. I decided to push the meal back until we could truly celebrate both our new house and having only one house payment! I also thought this would be a great opportunity to share the occasion with some of our closest friends who have been so supportive during the last few months when times were tough. I’m thrilled that Foodbuzz sponsored this meal. I always enjoy being a part of their 24, 24, 24 event. With all the fresh flowers on the table and the menu we selected, my friends declared this a “very Ina Garten meal”. I love Ina to pieces, so I thought that was a wonderful compliment. It definitely seemed fitting since so many of my “very dear friends” were in attendance! Champagne cocktails were a must since this was a true celebration. I had some strawberry puree in the freezer so I added a shot of that and a shot of apple juice to the flutes, and then poured champagne over the top. They had a cool tri-level look that isn’t really obvious from these pictures, and they tasted great. 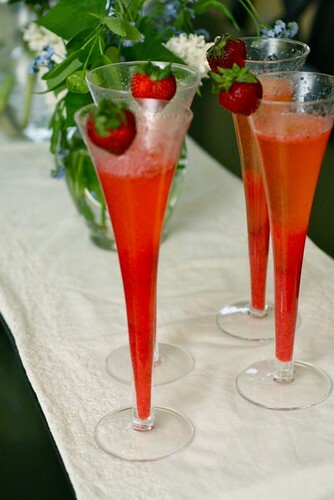 Strawberry and champagne were just made to be together. 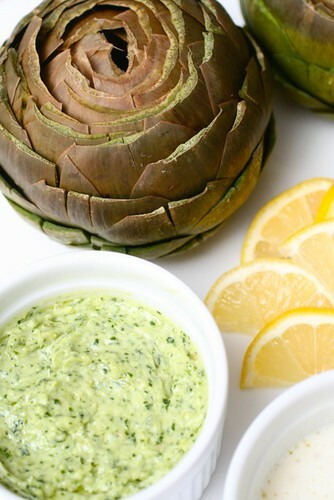 I’ve previously been totally intimidated by fresh artichokes, but knowing they are in season and how much my mom used to love them, I was determined to include them in the menu. Shanon taught me how to prepare them. We steamed them and served them with melted butter as well as a pesto mayo. They may not be the most elegant food for eating, but that didn’t seem to deter anyone. I have posted about these tarts as a full-size version before, but I have found that made mini-size, they make perfect appetizers. People go nuts for them (myself included). 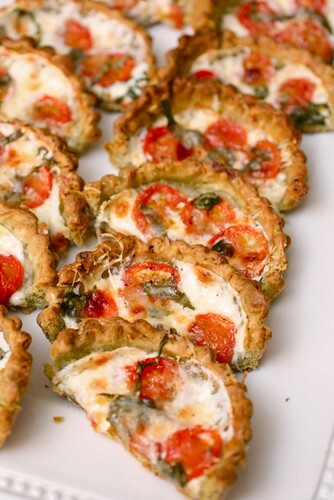 The basil-garlic crust really takes them to another level of awesome. The salad – oh, the salad. How I loved it. I have never been much of one for fruit in my salads, though I’m apparently coming around on that. Since lovely ripe strawberries are every where these days, I thought this would make a great starter. This was actually inspired by a selection from Panera’s menu last year. I never tried it but always thought it looked great, so this was my attempt to recreate it at home. 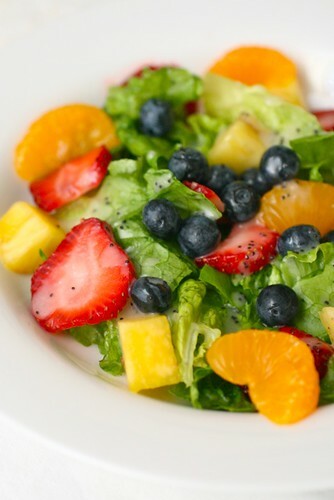 The poppy seed vinaigrette was very nicely balanced with acidity and creaminess, and the dish in general was just gorgeous with the colorful fresh fruit. It was fun to give guests entree choices in advance of the party. 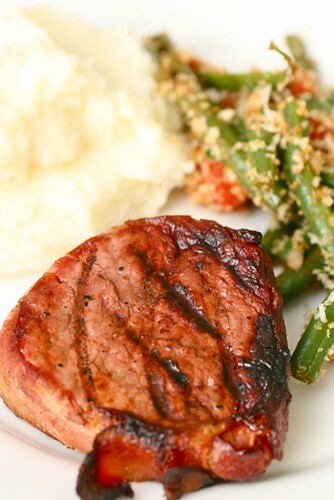 For the meat eaters, I knew bacon-wrapped filet mignon was bound to be a hit. Since it was raining we had to move our grill to the front porch underneath the overhang (classy, right?) but it worked out fine. Meat and more meat is always a popular choice! 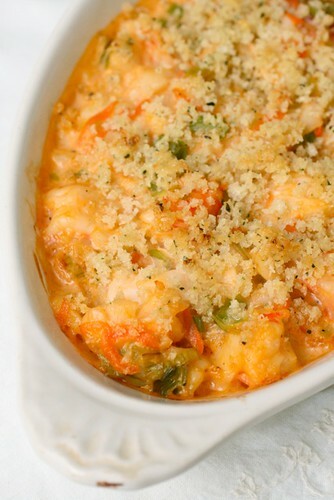 Okay, this seafood gratin is unbelievably good. This is the dish I have been most looking forward to making since we moved in October. With lobster, shrimp and cod pieces in a tomato cream sauce and a buttery bread crumb topping, how could this be anything but wonderful? Chicken gyros may be my favorite any-night dinner, but I think this has definitely taken the title of my favorite special occasion dinner. I forgot a photo of the roasted garlic mashed potatoes, but hey, we’ve all seen mashed potatoes before. Mashed potatoes + roasted garlic = delicious. Period. I’ve seen gorgeous green beans a lot lately when I go to the store, so I really wanted to include them in the menu. 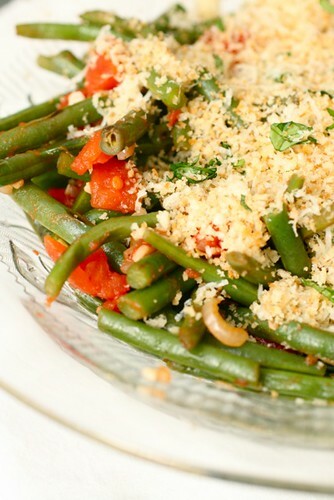 The tomato, shallot, and Parmesan-bread crumb topping were wonderful additions and I think this is my new favorite way to make green beans. 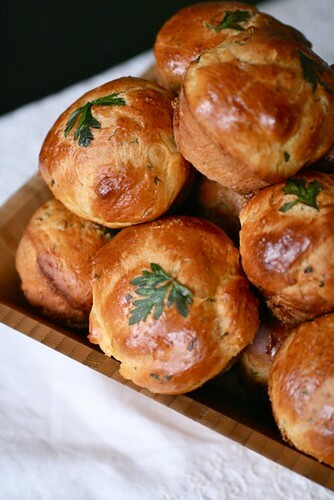 Typically I serve some sort of bread with a compound herb butter, but this time I switched it up and made a roll with herbs already included. These were very tasty and the individual herb leaves pressed into the tops made for an impressive presentation. I always pipe butter into individual dishes. It’s a nice, simple touch that takes next to no time but makes for a very elegant look. Holy dessert. This was a true show-stopper. My friends were all hovering while this was being served, just dying for a slice. I can’t blame them – it’s like dream food. 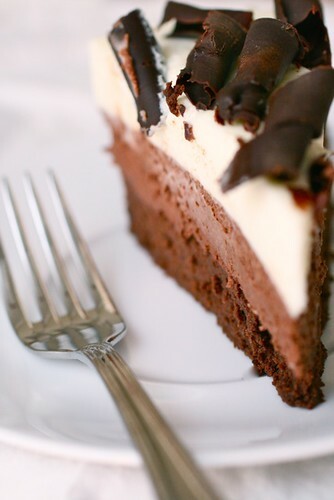 I’ve said before that I love triple chocolate anything, so triple chocolate mousse cake was bound to be heaven for me. As an added bonus for all those readers who have begged for a party-planning tutorial, here you go. This is how I make it happen, and take all the stress out of hosting a get together. 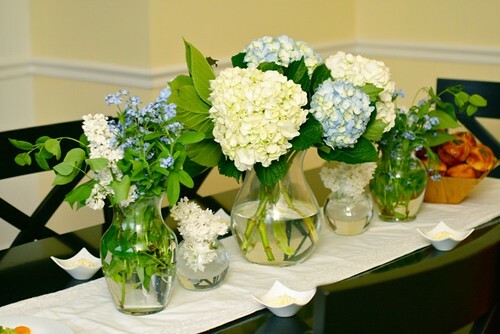 The general tone of your event – casual, elegant, or somewhere in between. What ingredients are in season – feature them! Keep the meal well-rounded – carb, protein, veggies, etc. Try to choose dishes that compliment each other. Difficulty level and time requirements of the various dishes – you don’t want to be spending too much time in the kitchen instead of spending time with your guests. Plan some items that can be made at least partially made in advance so you don’t have too much going on at once. 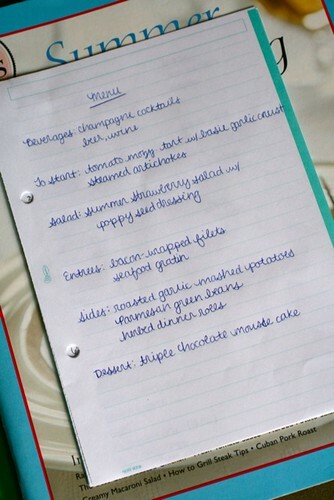 Any dietary restrictions, likes or dislikes of your guests. Get all of your recipe resources together in one spot. 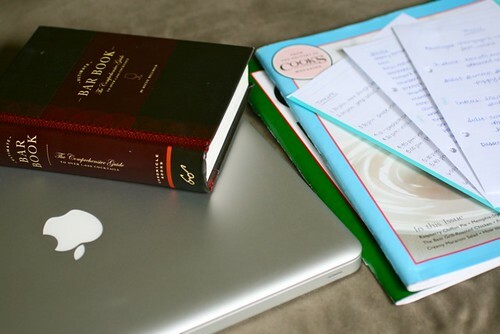 You need to carefully look through all the recipes in advance so there are no surprises when it’s crunch time. 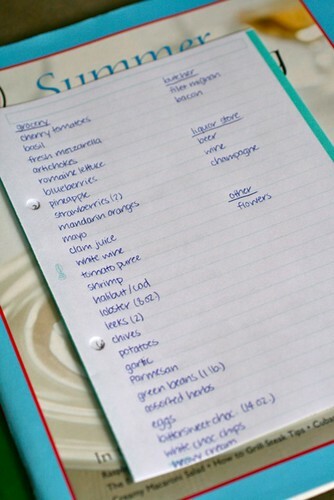 Make a shopping list. Be sure to include trips to specialty stores as well, such as the butcher shop, liquor store or florist so you remember everything you need to do. Write out a timeline for the day of the event. 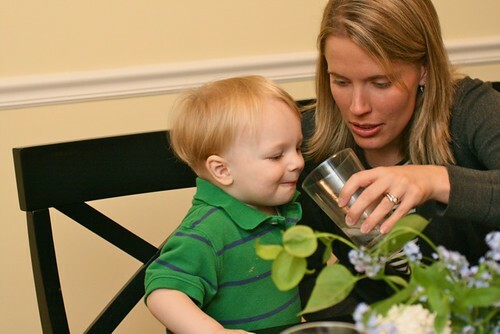 This is the most important step in planning, because it takes all the guesswork and stress out of entertaining. You think out everything in advance so that when the actual time comes, all you have to do is what is on the list. 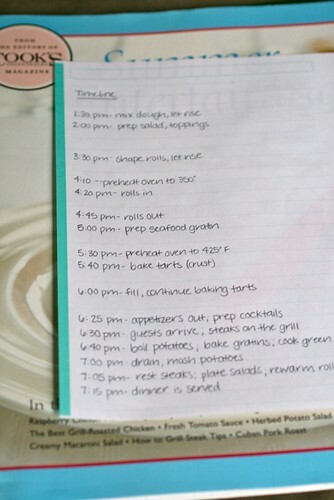 I usually start by writing the time guests arrive at the bottom of the sheet, and then work backwards in figuring out what needs to be done when so appetizers are ready on time, when dinner should be served, etc. 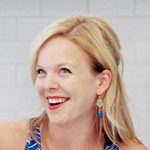 Even if you get behind and don’t stick to the timeline exactly, you’ll still have the general guideline of what to do when and it is hugely helpful. I also like to leave some blank spaces because inevitably I think of something I forgot to add initially. Recipes will be posted individually as future posts. Those that will be posted include: artichokes, strawberry salad, seafood gratin, green beans Parmesan, herbed dinner rolls, and triple chocolate mousse cake.